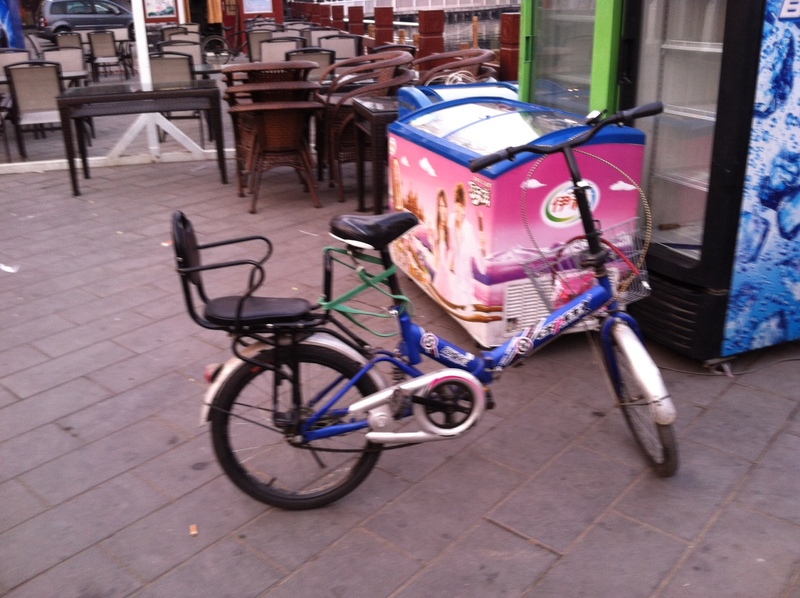 In virtually all of the photos I’ve seen of bikes in China, riders have not shrunk from carrying passengers on bikes, even if said bikes were technically not designed for this purpose. The rear seat on this bicycle is disconcertingly far back on the rear wheel, which must make the bike itself fishtail like crazy. So I find it especially impressive, or alternatively crazy, that the rear seat is large enough that it could almost certainly carry a second adult. And that seat does not lack style. Compared to the sea of gray plastic child seats I see mounted on rear racks in this country, it is a nice change of pace for the child seat to outclass the bike. 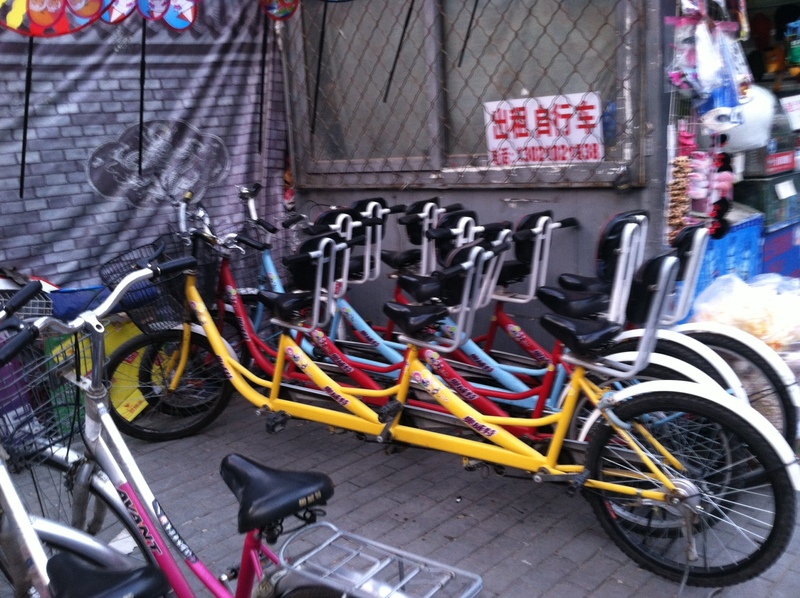 But if you really want to ride in style, you can rent a three-seater tandem. Compare these rides to the surreys you see in American parks: there is no comparison. I especially like that they come with fenders, chainguards, and front baskets, as though they were actually viable commuter vehicles, which seems pretty improbable. But it’s nice that that’s the assumption; tandems in this country seem primarily targeted to the road biking set. This is a shame given that kids love tandems. By contrast, the bike shops of the lake district are a lot more ad hoc. In Portland they put everything on cargo bikes, and I imagine that this is handy when you have a flat by the side of the road: rolling bike shop to the rescue! 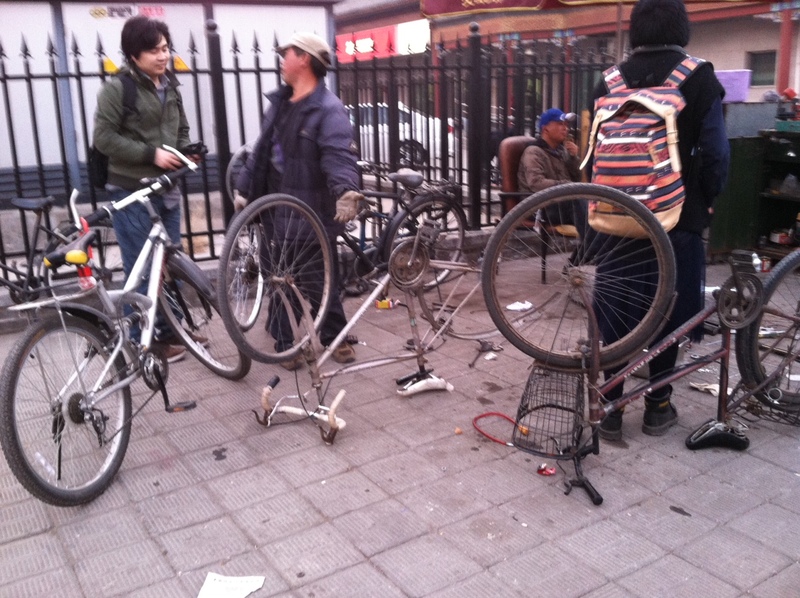 But in Beijing a bike shop is evidently a guy on the sidewalk. Despite having a lot less real estate at his disposal than even a tiny San Francisco bike shop, this guy has nonetheless provided customer seating. I thought that was a classy touch. 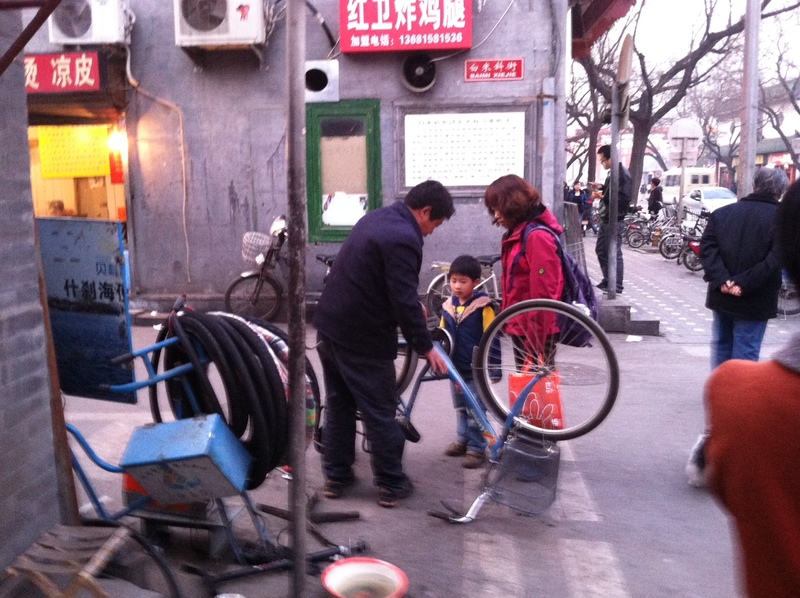 In keeping with the customer-focused theme, the owner of this open-air shop started giving a young customer a bike maintenance lesson while Matt was there snapping photos. I like that they’re working on another mama-bike–you can see it’s balanced on the child seat in the back, and has the usual commuter accessories: fenders, chainguard, front basket. The bikes in all of these photos probably sell for the equivalent of less than $100, and every single one of them is a more practical commuter than over 90% of the fixies I see in San Francisco’s Financial District. The US is a great country, but also crazy. Unlike me, Matt was not able to bail on many of his business obligations to ride bikes around a strange city, more’s the pity. 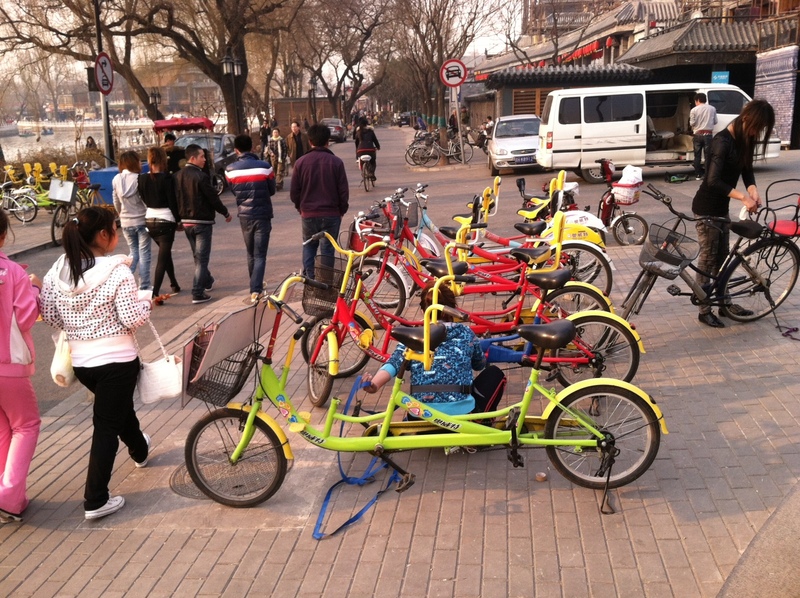 So his impressions of actually riding a bicycle in Beijing will have to wait for another time–there will be at least two more extended trips this year, and I have faith that eventually he’ll make it out of the taxi. He said he came back feeling much like this perhaps-too-honestly-advertised restaurant. 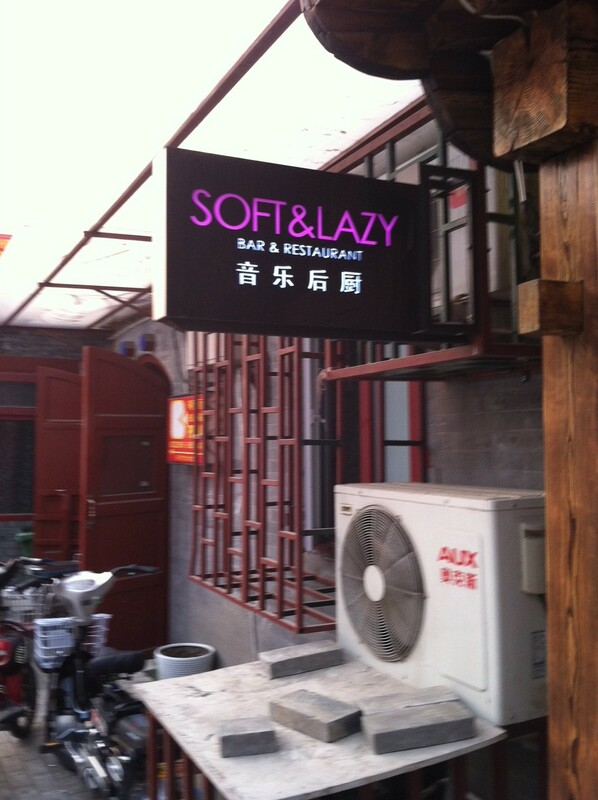 Chinglish: it’s funny because it’s true. I wish I hadn’t read this with kids looking over my shoulder. They want to go there (preferably by boat!) and ride that yellow triple. Wonderful pictures!